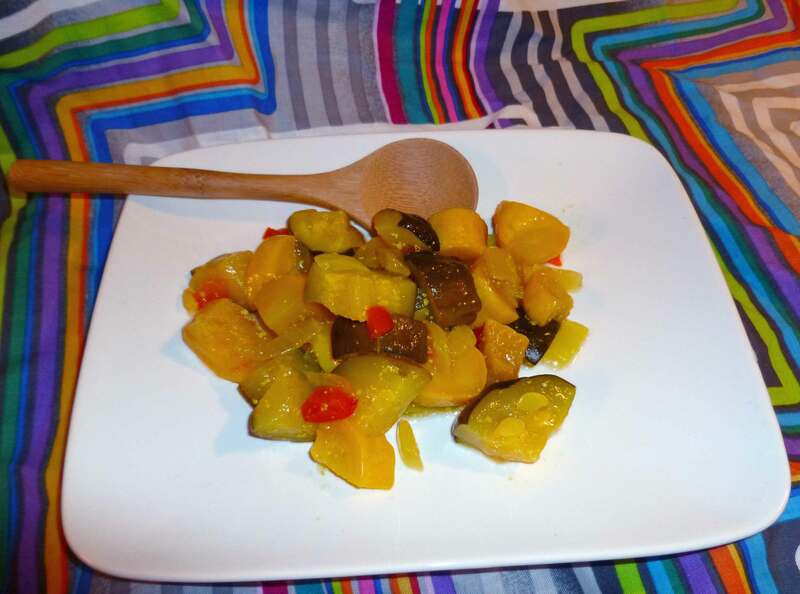 So here’s another canning inspired recipe, because these pickles were really a winner. I used the recipe from the Ball Complete Guide to Home Preserving, but modified it to leave out the ClearJel (which is modified corn starch) and to substitute the distilled white vinegar for apple cider vinegar instead. I did water bath can them originally, but I’ve rewritten the recipe here for a much smaller quantity and so that you can do them as a refrigerator pickle for those of you who don’t can. These would be great to do as a part of your appetizer plate for Thanksgiving. They’ll need to sit in the refrigerator for a week or so to absorb the flavors, so start them now for Thanksgiving. 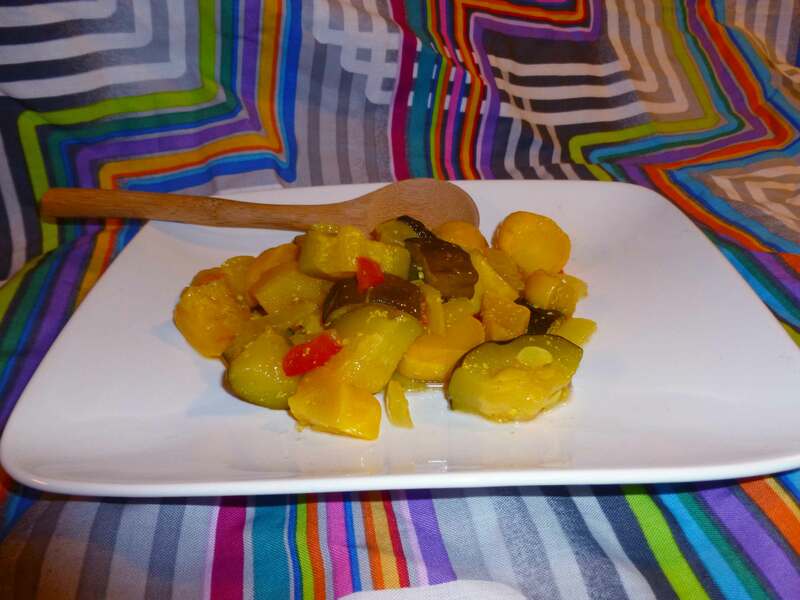 In a non-reactive bowl (stainless steel or glass), mix the zucchini and summer squash and onions. Sprinkle them with the canning or sea salt, cover and let them stand at room temperature for an hour or so. Transfer the vegetables to a strainer/colander over the sink and drain them well. In a non-reactive (stainless steel or ceramic or enamel, do not use aluminum or cast iron) sauce pan, combine the sugar, mustard, ginger, and turmeric. Stir well, gradually blending in the water. Add the vinegar and red bell pepper. Bring the mixture to a boil over medium-high heat, stirring often to dissolve the sugar. Add the drained vegetable mixture and return to a boil for two minutes. Ladle the mixture into a non-reactive heat safe container (beware that putting them in a plastic container will cause the plastic to be permanently dyed yellow with the turmeric). Your best bet is probably a mason jar or glass container with a lid. Just make sure to warm up the jar/container with some hot water (don’t leave the water in the container, just put the hot water in the container to warm it up and then dump it out) before putting the hot veggies and brine into it. Put a lid on the container and let it sit on the counter until it reaches room temperature, and then place it in the refrigerator for a week. In a week, enjoy the fruits of your labors! Great idea, it would make a great addition to Boxing Day lunch with the Christmas leftovers.